Check out our new and improved online store at SmileyCookie.com! We’ve been serving our sweet, smiling brand icon – that’s right, the one and only Smiley Cookie – to Eat’n Park guests of all ages for over 20 years now. In fact, we give away more than 1 million Smiley Cookies to children in our restaurants every year, and we donate hundreds of thousands more to local community and fundraising efforts. Of course, Smiley Cookies are easy to love. But even we have been surprised at the worldwide popularity of our signature cookie. In 2006, we started offering Smiley Cookies for sale online, and since then, demand for them has absolutely exploded. We’ve shipped Smiley Cookies to every state in the U.S., and we’ve even sent them to military addresses overseas. Smiley Cookie lovers have adopted this treat as their gift of choice for any and every occasion, from birthdays to baby showers to get-well gifts. The popularity of sending Smiley Cookies through our online store led us to re-launch the site just a couple weeks ago, with brand new products like cookie gift baskets, and features that make it easier than ever to send a gift that keeps on smiling. With these upgrades, customers can now select a delivery date, save delivery addresses, and ship their order to multiple addresses from one transaction. Our site is easier to navigate, with the option to shop by price, occasion, category, or even by holiday. Of course, we couldn’t implement all of these new features without offering some new products! Our new Mini Smiley Cookies are already a hit, and our expanded selection of gift baskets ensures that you’ll find the perfect present for anyone on your list. Plus, we’ve added more options to our Custom Smiley Cookie feature. Not only can you choose from more colors with which to decorate your cookie, but you can also select your favorite cookie shape. Warning: creating your own cookie may be addictive! Earlier this summer, we partnered with the YMCA of Greater Pittsburgh to send at-risk youth to Camp Kon-O-Kwee, where they would get to experience the outdoors in a safe, fun, and educational environment. Together with our guests, we raised $10,000 to fund this special opportunity for local children. So, what’s a day typical day like at Camp Kon-O-Kwee? Well, it’s pretty awesome! Camp counselor Rick D. sent us this summary of just one day at the camp. We’re exhausted just reading about it! Thanks for your help and support. This experience will make a big difference in the lives of these kids! The Aardvarks went on an epic hike to the highest point on camp – Eagle’s Nest. This brave group of adventurers walked along the banks of the Connoquenessing and then straight up the mountainside to an outcropping that gives them a true birds-eye view of the whole camp! The Barracudas spent their morning with some Firefly time and the indoor climbing barn, testing their skills on many of the 12 fixed routes that range in height from 15 to 40 feet off the ground and in the bouldering room to try their hand at traversing. The Dalmatians and the Elephants squeezed in the climbing wall AND the air rifle range in the morning… what a blast they had ringing the bell at the top of the rock wall! Everyone was ready for the all beef hot dogs, pasta salad, carrot sticks and watermelon by the time lunch finally rolled around. After lunch everyone took advantage of a well-deserved rest hour before heading down to the pool for swim time! After swimming, the groups that had not yet visited the climbing barn and the air rifle range made their stops while the Dalmatians made their trek to the top of Fombell at Eagle’s Nest. The campers enjoyed the chicken fajitas and a much needed break at dinner before they set off for some ultimate frisbee and ga-ga before gathering for their evening activities. Before dark, the Aardvarks, Barracudas and Copperheads played a popular camp game known as Capture the Camper/Capture the Counselor… think hide and seek on steroids! The Dalmatians and the Elephants had a fantastic time participating in Counselor Switch where they got to help the male counselors dress like the female counselors and vice versa. At the end they all get together to show their stuff on the runway as the campers voted for their favorite duo! 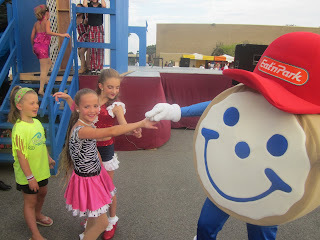 On Saturday, August 7, Team Smiley took a trip to Twinsburg, OH for the Twins Days Festival! Twins Days is an annual gathering of twins from all over the nation. While we were there, we met thousands of twins who dressed up for the occasion. There was entertainment, food, and activities for all to enjoy. Smiley’s favorite part of the day was the parade. He even brought his twin along for the occasion! Together they danced along the parade route and had a blast with all of the other twins. The twin Smileys were very excited to get to spend time together and celebrate this very special and unique occasion. At the festival, kids and adults alike enjoyed decorating their own Smiley cookies. Everyone had tons of fun putting creative smiles on their cookies and of course getting to eat their tasty treats afterward! Smiley twins rock the Twins Days Parade! For the third year in a row, one of our burgers has earned a first place award at the National Hamburger Festival in Akron, OH. This year, we’re proud to announce that judges voted our Original Superburger as Best Traditional Burger! The Original Superburger has been a guest favorite for over 60 years. We’ve been serving this classic since we opened in 1949, and it has only gotten better with time. This year, our very own Chef Regis Holden made a special trip to the festival to prepare the burgers. Topped with cheese, pickles, lettuce, and our own Sauce Supreme on a double-decker sesame seed bun, the Original Superburger was obviously a hit with the judges. Festival-goers also got to enjoy this award-winning burger, thanks to our team of champions who braved the sweltering heat to man the grill all weekend. Coming home with another win certainly made it worth the effort! The Original Superburger is our third burger to take top honors at the festival. Last year, our Black Angus Mushroom and Onion Burger won the “Best Traditional Burger” category, and in 2008, our Black Angus American Grill Burger was voted “Best Creative Burger.” We’re excited to add the Original Superburger to this list of winners, and we’re already looking forward to next year’s contest. 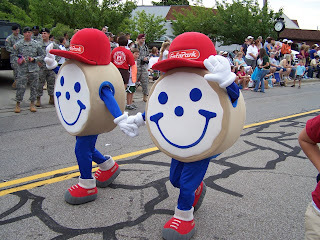 For more about the National Hamburger Festival, click here. And to see our entire burger menu, just click here. Our team serves up award-winning Superburgers to festival visitors, while proudly displaying our past awards. Summer brings lots of warm weather, good barbecues, and church festivals. This past weekend, Team Smiley visited two outstanding local parish festivals, and we had a great time at both! On Friday, we headed up to Wexford, PA to attend the St. Alexis Parish Festival. This yearly church celebration turned out to be one of our favorite events! With some great help from our contact Chris H., we set up our Cookie Cruiser and cookie decorating tent right at the heart of the festival, where we were able to watch all of the young dancers perform on stage. Smiley even got in on the action and danced with some of the participants! Our cookie decorating station was a hit, thanks to all of the kids who stopped by to enjoy the fun activities. With great food, fun games, and a wonderful crowd, Smiley and his team had an unforgettable experience! The following day, we visited the St. Athanasius Church Festival in Pittsburgh. We were surrounded by good food, fresh baked goods and produce, and some great people. With this being our first time at St. Athanasius, we didn't know what to expect. After about five minutes of being there, we realized that it was going to be an awesome evening. We met all kinds of children who were very eager to decorate their own Smiley Cookies, and boy, did they show us how to make a Smiley face! After a little bit of rain, Smiley stopped by the festival to visit and play some games. 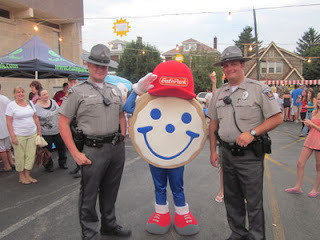 He met people of all ages and even got his picture taken with West View police officers! In all, we had a fabulous weekend, and we want to thank all of the festival volunteers who made us feel right at home! We’re excited to announce that Sarah Marince, singer of our “Place for Smiles” jingle, made her way onto the Billboard country charts with her new single, “In the Mean Time.” Congratulations, Sarah! To preview Sarah’s song “In the Mean Time,” visit her website at www.sarahmarince.com. The full song is also available for download from iTunes. Just over two years ago, we enlisted the help of this up and coming country singer and Pittsburgh native to record an updated version of our classic jingle. Then just 17, Sarah was already opening for big country acts like Lonestar and Taylor Swift, and was regularly performing the national anthem at Pittsburgh Penguins games. Her fresh, upbeat sound was a perfect fit with Eat’n Park, and we were happy to showcase local talent from our hometown. That summer and the summer after, Sarah toured our restaurants to offer free concerts to Eat’n Park guests. Joined by Smiley and his crew, Sarah delighted guests with renditions of the new version of the “Place for Smiles” jingle, as well as performances of her own songs. This year, Sarah lent her bubbly personality to our summer commercials, interviewing restaurant guests to find out what they love about Eat’n Park. (Our strawberry muffins are her personal favorite, by the way). As Sarah’s star continues to rise, we wish her all the best. Cracking the Billboard charts is certainly something to smile about! New! FarmSource Vegetable Soup and Corn on the Cob at Eat’n Park! After a hot and humid July, August has arrived. For many, summer is winding down, but at the same time, local produce is just ripening up. What does that mean for Eat’n Park guests like you? Well, it means that when you join us for a meal, you get to savor those locally-grown fruits and veggies on our Soup & Salad Bar and in our menu items. We’re featuring a lot of local produce right now, but what we’re most excited about are two brand new items that just became available this week. FarmSource Vegetable SoupOur new FarmSource Vegetable Soup is a fantastic addition to our soup lineup, and it’s bursting with flavor from fresh, local veggies. Carrots, cauliflower, zucchini, squash, and more are all simmered to perfection and mixed with bow tie pasta. Not only is it delicious, but a cup of this hearty vegetarian soup has only 59 calories! This soup will be available every day for a limited time only, so stop in and try it today. We’re also excited to offer locally-grown corn on the cob. Throughout the next few weeks, we’ll have several different varieties available as they’re harvested. Enjoy a full ear as a side with your next meal at no additional charge. To learn more about our FarmSource program and to see some of the farmers that we work with, checkout our FarmSource page. And to keep up with what local produce we’re using at Eat’n Park from week to week, just stop back here on our blog and check out the Weekly FarmSource Listing section.